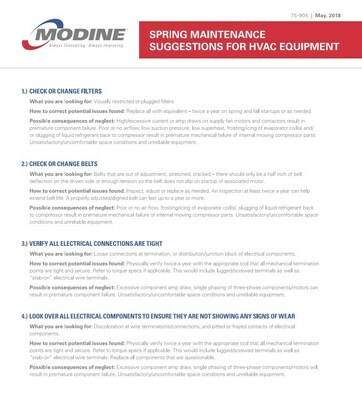 RACINE, Wis., May 2, 2018 /PRNewswire/ -- Modine Manufacturing Company (NYSE: MOD), a leader in technology in the HVAC industry, has released a commercial HVAC maintenance checklist to help commercial property owners, facility managers and contractors keep their equipment running smooth this summer. "In addition to adding extensive longevity to the life of the unit, regular maintenance is key to keeping your HVAC equipment operating reliably and at peak efficiency," said Shawn Kasuboski, technical services manager for Modine. "This checklist gives everyone, from the property owner to the contractor working on the HVAC equipment, handy tips to ensure their system is in top shape. Following these tips now can greatly reduce the risk of breakdown during extreme weather conditions when the unit is most needed, and when repairs are most costly." To download the checklist, visit https://www.modinehvac.com/web/resource-center/is-manuals.htm. For more information about Modine's HVAC solutions or to find your local distributor, visit http://www.modinehvac.com. Modine, with fiscal 2017 revenues of $1.5 billion, specializes in thermal management systems and components, bringing highly engineered heating and cooling components, original equipment products, and systems to diversified global markets through its three complementary business units: Vehicular Thermal Solutions (VTS); Commercial & Industrial Solutions (CIS); and Building HVAC Systems (BHVAC). Modine is a global company headquartered in Racine, Wisconsin (USA), with operations in North America, South America, Europe, Asia and Africa. For more information about Modine, visit www.modine.com.